The few times that I have been privileged enough to travel abroad, have been holidays gifted by my parents. However, if my life had been confined to the shores of the UK I would still be enriched by infinite exploring opportunities and touched by extreme beauty. Often we are guilty of forgetting 'the local'........the beauty on our doorstep. ​Whilst in Malta I traveled in a small boat and sailed through the Blue Lagoon, an awesome experience I will never forget. Yet a few miles up the road from my home I have also kayaked through the caves of Auchmithie where the sea was an atomic glowing emerald green: an experience equal to the one in Malta. That is why I am eager to engage all opportunities to explore, never bored to revisit the ever changing 'local' and excited when I discover new inspirational environments. It was early in the morning that I met my architect friend Mark Chalmers in Dundee on a quest for the new. Our plan was to take photographs in two locations. Firstly, at a derelict hotel that has been empty for a decade then onward up the A9 to Glen Lyon and Ben Lawers Dam. The drive up the winding road to the Glen was eerily quiet. The scenery was breathtaking. Near to the Dam on the right hand side three quarters of the way up the hill, Mark pointed out a round building that looked like a gunning placement. It was an overflow tunnel linked to the dam. The Dam itself was a cold intimidating, powerful structure. The volume of water it restrained, oppressive. We did not see anyone else while we explored. Though I don't doubt we where being watched on CCTV. Alone, we quietly, respectfully and reverently took our photographs. Greedy to capture as much detail as I could I set my aperture for a large depth of field. A plan that backfired as I over exposed a number of my shots. ​The view on both sides of the Dam affected me. I will most certainly be returning. Just before sunrise on Sunday morning I waited with Andrew at the side of the road for his transport to arrive. The night before he had left his tractor on site. Having asked Andrews permission beforehand if I could explore the farmyard, I waved goodbye to him and set off eagerly with my camera and tripod. It was bitter cold and the rising sun did nothing to ease the biting chill. The sunrise did however transform the muted mid tones of my rural locale into sharp clean graphic textures. Like yesterday, time stretched and warped making hours feel like minutes. I do not exaggerate when I state I could easily lose myself in a series for years and not be bored. There is always too much to be seen in one visit, always a beauty that you will miss. The beauty ever evolving. I am ever seduced. In the evening I showed Andrew what I had captured. It was funny when I had to explain where one of the shots was taken even though he has lived there all his life. To be fair I suppose we are all guilty of observing the overall view and not inspecting the detail. In a car park of undisclosed location I met my new friend Mark Chalmers - our mutual interests being photography and disintegration. An architect to trade, in his free time Mark photographs abandoned buildings in the UK and abroad. His love of these forgotten structures is recorded sympathetically and kindly with expired analogue film. His reportage is accompanied by journalistic research and passion. The end of our adventure was a late lunch and the chance to find out more about each others interests. This is the second time that I have met Mark, the first time being at a pinhole camera workshop. Since embarking on the Master Programme I have since met many kind, interesting and clever people who have been willing to share their interests, time and knowledge with me. My new friends however have made me realise how small my world has been up until now. At lunch Mark asked me how many other buildings I had explored. 'Not many' my reply. The first is my daughter, I have devoted most of my time to enriching her life: and now that she is on the cusp of adulthood I have time to devote to myself. ​I am afraid to explore alone. ​I am a white, privileged woman living in a free country. I have a Higher Education. I have a well paid job and own my home. Surely these attributes would keep me safe. However, for near forty years I have lost count of the times I have had to deal with groping and/or sexual aggression. Ninety nine per cent of time by men who pertain to be my friend, who are equally privileged. As a result I am afraid to be alone in a semi isolated location or have to face the accusation of 'what were you doing there by yourself', if i did go alone and something did happen. Adventures with my camera are therefore undertaken with people that I trust. I am thankful to the male friends in my life who treat me with respect. DOCMA is then shown as a complete film. Early Wednesday morning I made my way to Woodend Barn in Banchory to take part in a documentary making workshop. The workshop was led by the filmmaker Anne Milne. Anne introduced the class to the rules of DOCMA and explained how the DOCMA Collective grew out of a collaboration with DocKlub, a monthly support group for documentary filmmakers based in Edinburgh, Scotland. In preparation for the workshop we each brought a single word theme, that may or may not be chosen. A lottery then ensued to decide our groups, theme and documentary styles. Just over two hours later we parted company with a deadline of four days to film, edit and upload our one minute films. The completed films will be uploaded at a future date to the DOCMA website. Very early Sunday morning I was up and ready to navigate my way to the small East Coast fishing village of Anstruther in Fife. My close friends will understand my anxiety: I find it very difficult to follow directions. Luckily I had a guide, Google Maps. Even with my trusted guide at hand I set off early because I was worried about finding a parking space. 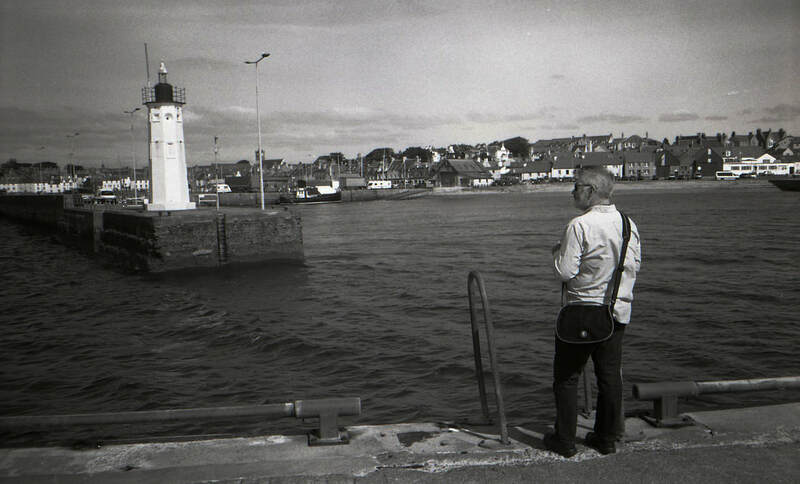 Anstruther is a popular tourist destination. I arrived a little past 9am and successfully found a parking space. Five minutes later my friend Donald arrived in the same car park. Not a coincidence as we had planned to meet up and take photos together. To satisfy our analogue addictions we both obviously brought along a number of cameras. Donald: An experimental 360 degrees multi pinhole camera invention and two film cameras loaded with colour film that produces a vibrant and saturated vintage look. ​I brought along my 35mm underwater film camera and a number of pinholes cameras that I had made out of 35mm film canisters. We had a lovely day exploring, taking photographs and catching up on each others news. It is easy to take photographs with Donald. I do not have to apologise for stopping off mid conversation to immerse myself in an exposure that has presented itself to me. I understand too when he does the same to me. Meeting is an opportunity for me also to greedily furnish knowledge from this clever modest man. ​The sun shone brightly, so brightly that I was unable to ​make pinhole exposures as my calculations were coming out at a second. I did however have success with my Canon AS-6 underwater camera. Not only did it not leak but it produced sublime effervescent dreamy prints. I cannot express how excited I am to go playing with it again soon! ​Every coastal visit I am compelled to search the tide line for treasure. So as not to be a boring companion I curtailed my addiction by allowing myself just one find. The remainder of our day was spent in the Anstruther Museum followed by fish and chips for lunch, then finishing off our films. At the beginning of the summer holidays my friend David and I had agreed to meet up and go hill walking. Today we met to explore standing stones nearby his home then afterwards ascend Dunsinane Hill and walk onto Kings Seat. At our start point David was surprised to learn that I had not brought along my film camera. My reason being that I wished to wholly immerse myself into our shared experience. Generally when I go out to take photographs, I go alone. I am selfishly on a mission to greedily capture and I do not want to compromise. Such times can only be shared with an equally keen and selfish eye. Parking on the roadside we entered a small wooded area. Hidden within its interior two standing stones, modest in stature and camouflaged by moss. A large fallen tree with a surprisingly shallow root stock had demolished in half a tin roofed building of unknown use. 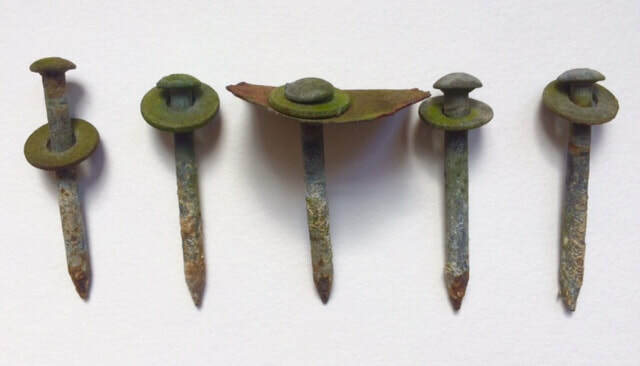 From the wreckage I salvaged 5 nails with accompanying washers. A short drive away we began the ascent of Dunsinane Hill. Although the sun was out, grey clouds in the distance threatened rain. Whatever the elements decided to share though my day would not be spoiled. At the summit the wind blustered rudely in our faces but the panorama was the reward for our hard work. The remainder of our walk was a synthesis of sun and blustery winds as we descended and ascended on route to Kings Seat. Although it threatened rain the showers prevailed on the periphery. On our way we encountered grazing farm animals, a frog, buzzards and two deer. We did our upmost to avoid the ticks! 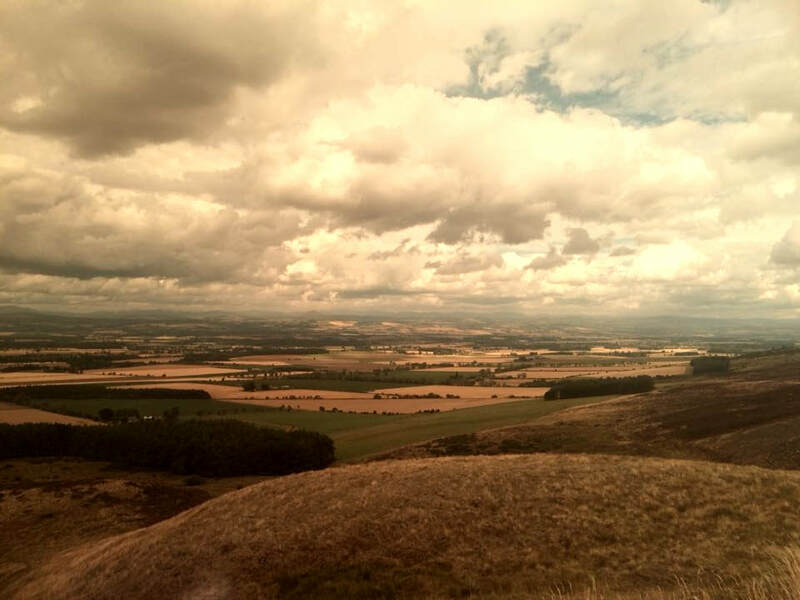 I took only one photograph with my mobile phone on our walk when we reached the summit of Dunsinane Hill. Truly though I did not need to take even that, as the shared experience with my friend was all that was required to nourish and inspire me. The HND student exhibition marks the end of yet another academic year. Their summation is a happy reminder that I will soon have six weeks in which I can go exploring with a camera, collect from the tide-line and play in my studio. In preparation I have been trawling my favourite online auction site. My intention is to develop the glass cyanotype images that I housed in vintage darkroom lamps - the mains wiring jarring the aesthetic. My solution is to wire my new versions with an internal battery so that they can stand alone on a plinth. As part of my exhibition at the Meffan I agreed to do a pinhole camera workshop. By way of introduction to this magical pastime, a low cost approach was adopted so that students left knowing that you didn't need to spend lots of money. Knowledge that has been generously gifted to me was in turn passed onto my attentive students. It is fair to say that my pupils left enthusiastically clutching their new camera. After less than five minutes in my car I arrive at the coast; my favourite close by place to explore being where the Elliot is absorbed into the North Sea. I cannot tell you how many times I have visited this spot, for I visit it often. It is here that I am able to simply lose myself in my thoughts and merge into the landscape. As I explore the shore I am compelled to take photographs and collect from the tide line, it is a dependable place, always there for me, providing me with solace, food for the soul and treasures from the sea. Although the Scottish coastline is the principal stimulus that feeds into my art practice, it is not the sole environment that moves me to create. In the hills too, my soul is free to leave my body and make discoveries. However the effort necessary to reach a summit can prove challenging as I am physically, mentally, geographically and environmentally challenged. The hills are my father and the coast is my mother. I am rewarded and punished by both. I cannot exist without either and I am constantly torn between the two of them. The main challenge I face when wishing to explore the hills is my difficulty with navigation. As a result, I am compelled to make the journey with a companion. The best companion is one who not only can lead me safely there and back, but who also shares my desire to ponder and wonder. My goal is never a race to the top, or to add another tick on a growing list of conquests, but to experience and enjoy what the environment has to yield. I am an observant trespasser, hungry to feast on the landscape and its secret contents. coming face to face with a lone deer in the wilderness. on the bonnet of my car looking up into the sky at the Leonid showers. tracking the metamorphosis of tadpoles. walking slowly homewards in a warm thunderstorm. listening to the pebbles on a beach being reallocated by the sea. marvelling at the aurora borealis. the smell and texture of warm moss. the first kiss.......no, every kiss with my lover. Walking is not a new instrument by which I engage and make sense of the world, as a teenager I would roam the countryside for miles with my younger brother. Whole days could be easily lost in discovery and play, we were like feral animals. For our days journeying, we consulted no maps and made no plans except to return in time for our evening meal. It was a time of no mobile phones but we did not feel unsafe, I was connected to my brother and connected to the land. We wandered and wondered, we made bows and arrows, we built a tree house, we fought viciously, we laughed hard and free, we were intrepid explorers, happy companions, and we made the best of memories. And now, as then, walking and exploring is still the principal method I employ to make sense of the world, my placement in it and my placement in relation to everything else. My expeditions may take the form of a trek in the hills, an urban flaneur or a coastal quest, the location is not important but the journey is. My art is a response, the workings out, the final summation. On any journey, at any point, I may be drawn to an object that I consider being beautiful and that I must own. These objects and the experience combined will inspire idea generation and production in my studio or darkroom; they also maintain and augment my happiness and well-being. 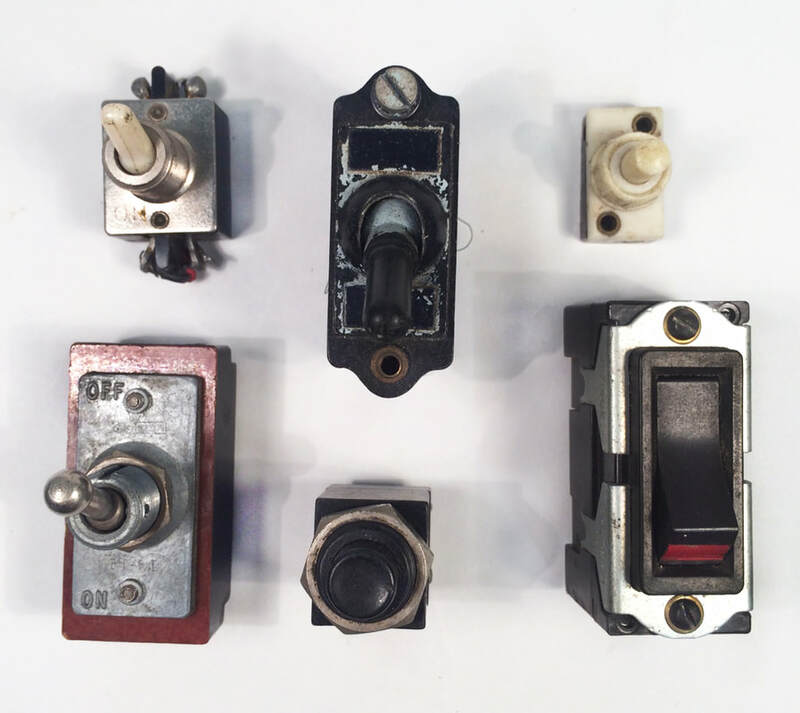 It is the aesthetic qualities of my found objects that initially draw me to them. Because of these treasures, I have come to expand the latitude of my own definition of ‘beauty’. It is a genuine enigma to me that what I honestly and wholly consider to be ‘beautiful’, what I am physically and emotionally attracted to, is in turn defined in opposition to mainstream notions. It is my intention and hope that my artworks may inspire a viewing audience to wonder, that they might ask what the object before them is, maybe even ponder upon its history and origin. But does it ultimately matter though if we know the identity of an object? Can we not just enjoy these finds for the unknown, tactile, sea worn treasures that they have become? Through the deliberate placement of my found objects in a gallery space I hope to give viewers the opportunity to contemplate the visual and tactile qualities of these exhibits. I wish to invite you to inspect the objects intimately, to appreciate the aesthetic qualities first and then to maybe also consider what the object was and where it came from. This exhibition is the culmination of two years worth of walks and the objects I have collected. Explorations and interactions translated into emotive responses. My outcomes are not intended to be pretty, mainstream, or saleable. They are instead a self indulgent consequence. Journies of discoveries, problem solving and pleasure seeking. 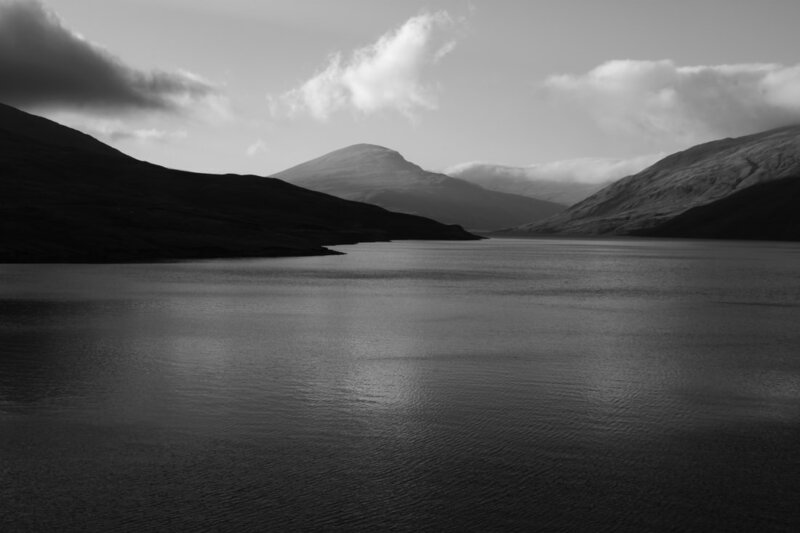 I would like to end this introduction to my exhibition with a quote by the Scottish writer and explorer, Nan Shepherd. “I believe I now understand in some small measure why the Buddhist goes on a pilgrimage to a mountain. The journey is itself part of the techniques by which the god is sought. It is a journey into Being; for as I penetrate more deeply into the mountain’s life, I penetrate also into my own”.